Want to run a Windows Vista Sidebar and Gadgets running on Windows XP? The Windows Sidebar and Gadgets feature introduced with Windows Vista is just much like widgets oon Mac OS 10, Google Desktop Search and or Konfabulator which Yahoo has acquired now. Gadgets can help to improve your productivity by introducing features such as calendar, sticky notes, clock, weather, stocks quotes, music player or a running slideshow of your favorite photos. Unfortunately, the sleek Windows Vista Sidebar is an integrated feature of Vista and not available as a separate product. However there are tons of freeware which can help you to achieve the same effect. thoosje.com has released a similar sidebar for Windows XP that looks and works just like the Vista Sidebar. 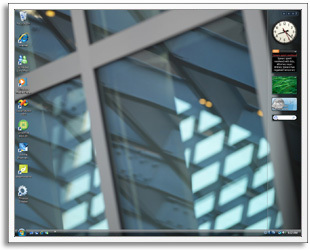 Thoosje’s Vista Sidebar is also part of the Vista Transformation Pack that is quite a popular package for making your XP machine look like Windows Vista.